Everybody loves a good pint or two after work before hitting the sack. Being the oldest and most widely consumed alcoholic beverage all over the world, beer has a special place in the common consumer household. Homemade breweries and craft beers have filled a special niche to satisfy the demand for more robust, healthy ale and smooth, elegant lager. Homemade beer making is so accessible now that you too can make your own. Whether you are planning to give your friends and relatives your craft beer or build your own homemade brewing company, create a more personalized product with our beer labels. We offer a wide range of options to fit your beer bottle preferences. 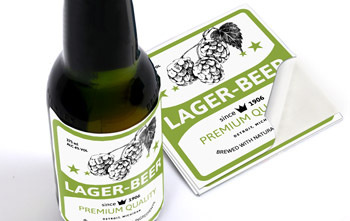 Choose between two types: cut-to-size beer labels for individually cut labels or roll beer labels for easier application. Our self-adhesive beer label backing can stick to any smooth surface and withstand extreme temperatures. Beer Labels is rated 4.0 out of 5 by 2. Rated 4 out of 5 by FrankieD from Good start Bought 100 labels for my beer and was not sure what I really wanted. Started with a white square and included a photoshop pic... came out pretty good and I need to tweet my product. Need to work with this company to get a label shape other than the basic square and they will do that effort. Will be ordering 1000 more for next batch. Thanks!